March and April are the two windiest months of the year and this year has been no exception! Winter just does not want to go away. The water temperatures are running cooler than average, but fishing has been good when the weather allows. I have been using swimbaits almost exclusively with the occasional fish caught on a jigging spoon slab. Slab season will be here soon, but I really love casting and reeling those swimbaits....in my opinion, the most fun way to catch, and my favorite. Some days we will cast. let the lure sink to the bottom, and catch them deep with 1.5 oz jigheads on 5-inch Sassy Shad, and other days we will use 3.4 oz with Cohos just casting and reeling. It all depends on where the active fish are in the water column. Yesterday the active fish were up high in the water column, so we were just casting and reeling as fast as we could, and loaded the cooler pretty quickly!! 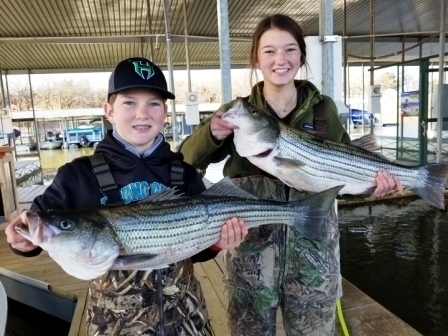 The water will warm quickly soon and the Striper will be very active. They are returning from their up-river spawning and will be very hungry! Call now to get on the water. My book is filling up fast so do not hesitate! www.laketexomafishingguides.com ....easy to remember and to find!! !